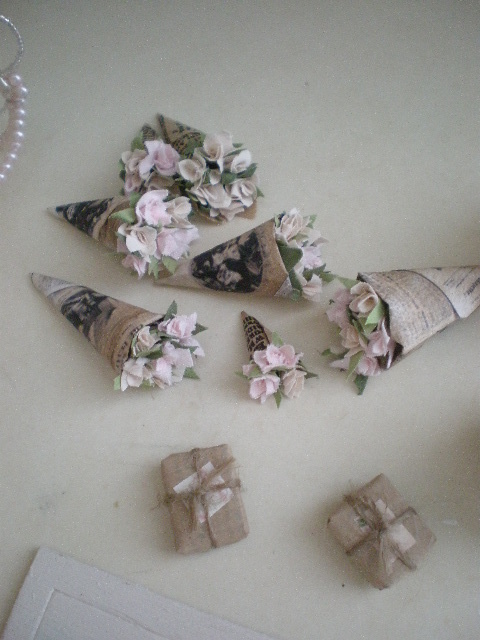 I'm waiting for my next project, but in the mean time I worked on some little things. 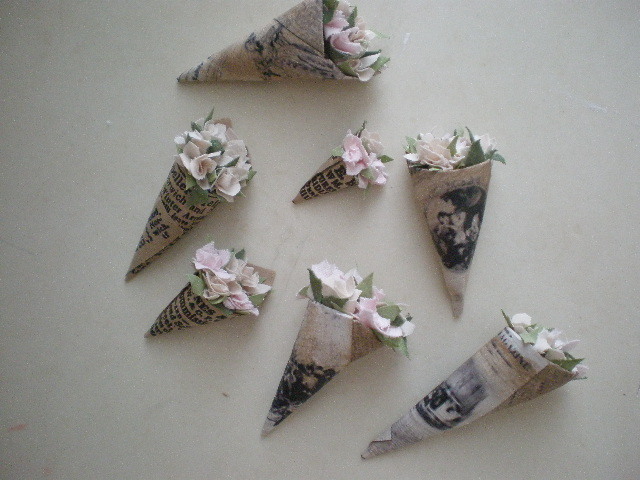 I saw roses wrapped in newspaper in a magazine and I had to make them in mini form. 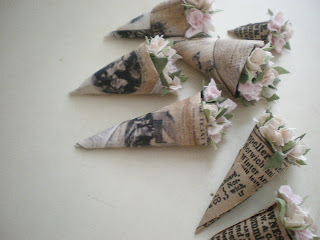 I used a printable dollhouse newspaper for some and a store bag that's printed with old vintage ads for others. 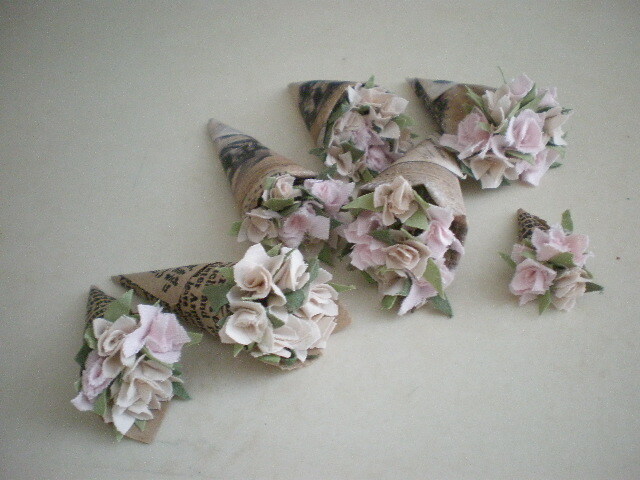 The roses are my handmade from cotton fabric I dyed pink and cream and green for leaves. I'm sure they're going to give my houses that romantic touch. 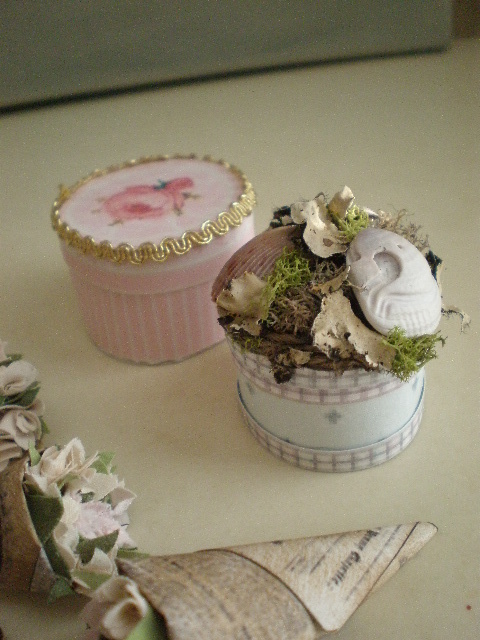 I also tried out a couple of packages. 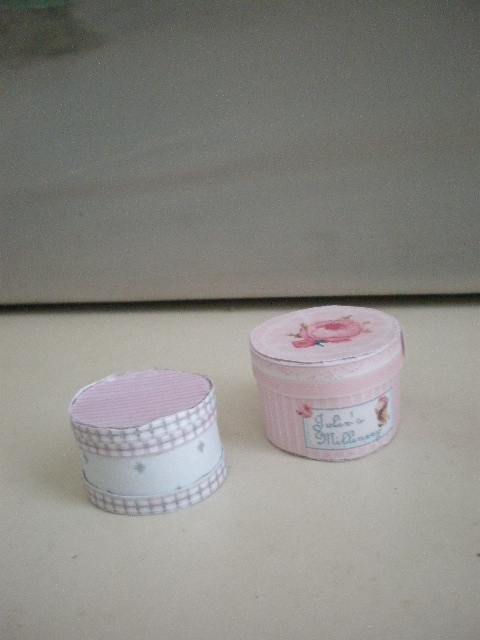 And hat boxes. I just printed those off the internet. They didn't turn out quite like I wanted. 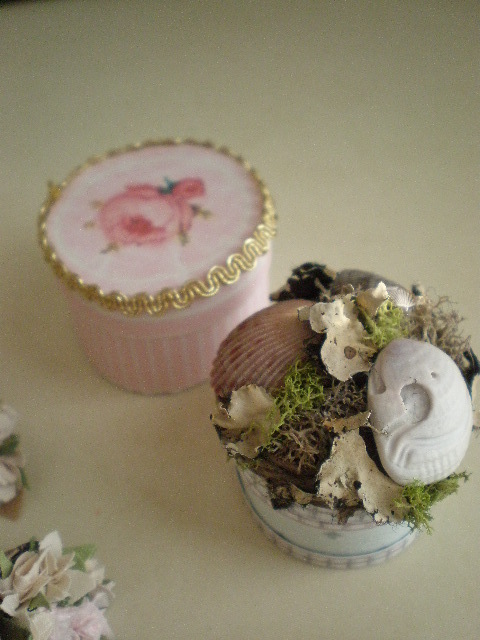 I added some moss and sea shells to the blue one. 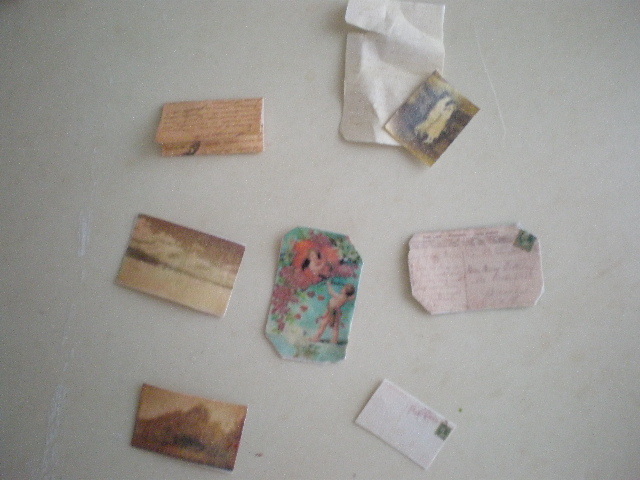 I also found vintage post cards, letters and pictures that I printed out in miniature size. I put some gloss on the photos to make them look more real. I am so loving those petite newspaper wrapped roses!!!! Oh my goodness, are these not the most adorable little things! Those little roses in the newspaper are so cute, I want to eat them up. Like the first commenter, I can't wait to see where you use them also! so good to hear from you sweetie! 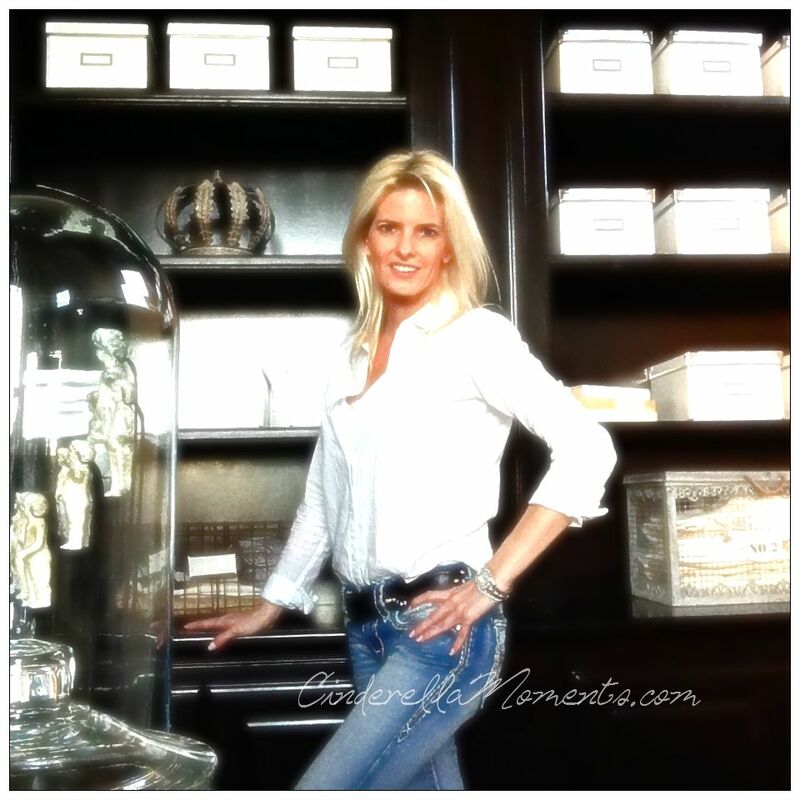 Wow, that is exciting....looking for a new house, a lot of the fun is in the looking too, but will be praying you find something that you are in love with!! Love all your new itty bitty cutsies. Those flowers wrapped in paper are just too cute, and I am sure you have good plans for all of these neat items, can't wait to see what you do with them. they were just coming down the runway into Orlando. They honeymooned in Jamaica. He said they had a great time, and I am so happy for them. He said they are a bit more tanned than when they left, I am sure they are!! Genial idea, a mi tambien me gusta ver revistas de decoracion y pensar en hacerlo en miniatura, tu trabajo ha sido excelente, las cajas fantasticas, pero mi favorito son los periodicos con rosas, probare a hacer uno con tu permiso, un gran beso. They are so cute. It is interesting wait for your next froject.